Despite that sack/ safety that gave the U an early 2 nil lead, and despite the lack of TDs by the Cards in the first quarter — two more drives, two FGs — Miami was never in the game. It can be argued that, other than that safety, the only gaffe of consequence committed by U of L was Charles Gaines taunting penalty in the middle of the 2d Q. It kept a Miami drive alive. But, on a night when Louisville did little wrong, Gaines, and his teammates, were saved later when backed up in their own red zone. Marcus Smith sacked Miami QB Stephen Morris, forcing a fumble, which was gathered in by Brandon Dunn. The ‘Canes didn’t threaten again until the 4th Q.
I’ve posed this query before, and in light of his transcendent performance in Orlando, ask again: Where does Teddy Bridgewater rank in the hierarchy of U of L athletes all-time any sport? No question he’s the equal of Griffith, Unseld, McCoughtry, et al. Yet, one must wonder, all things considered, despite the lack of a national title on his resumé, does Teddy B stand at the top of that list? I wouldn’t argue against it. I mean, the kid laughed his way through the game. Literally. Most of the ink today in the wake of last night’s Cardinal W, nationally and locally, has focused on Bridgewater. I would love not to follow in lock step, to find other keys to the smackdown and spotlight them. Bridgewater went 35/ 45 for 447 yards and 3 touchdowns. He ran for another. He completed tosses to 10 different receivers. He completed 11 of 13 passes on 3d down. Let me repeat, he completed 11 of 13 passes on 3d down. He rushed for 24 net yards. My favorite sequence was on the Cardinals’ last drive of the first half. A slant to Robert Clark on 2d & 10. That rainbow to Copeland for a new set of downs. Then 7 more to Copeland on the sideline. Followed by a strike for 16 yards and a first down to Parker. Followed by the TD strike to Harris for the 22-2 halftime advantage. 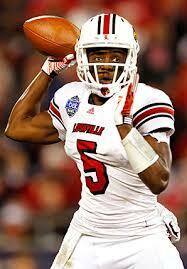 Can we say enough about Teddy Bridgewater’s performance in what will surely be his last game as a Cardinal? Honestly? No. It was that good. And, frankly, it was just about matched by the show put on by Louisville’s defense. Miami averaged 1/2 yard per carry on 28 attempts. That’s right, fourteen (14) net yards rushing for the Hurricanes. Their best rusher didn’t play, but, uh, so what? Stephen Morris, so harried was he, completed but 12 of 27 passing attempts, for an undistinguished and ineffective 160 yards. The Canes were ofer 3d down in 11 tries. Louisville had 8 tackles for losses — Brown, Burgess and Smith, 2 each; Lee and Reve with one. Vance Bedford’s dancing D worked almost perfectly.1 Miami’s offensive line appeared befuzzled all night. Among the Cards’ elite receiving corps, DeVante Parker with 9 catches and a TD, and Damien Copeland with six catches, starred as usual. But I must give props to the too oft injured Michealee Harris, who grabbed 4 throws, one for a score, in a performance that displayed what his career should have looked like so far, but for his misfortune. Sean Watson’s game plan on the offensive side was as exquisite as Vance Bedford’s on the other. Charlie Strong proved, if nothing else, he can get his team ready to play an outfit from Florida in the post season. He was far more animated on the sideline than I’ve ever noticed. Even more than last year in the Sugar Bowl. What might this glorious and supremely successful 12-1 season have looked like had U of L’s D not melted down in the third and fourth quarters against Central Florida? If the Cards hadn’t more or less sleepwalked through Ws over Memphis, Houston and Rutgers? 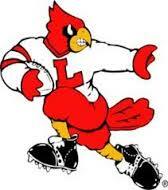 As it was, U of L faithful will have to settle for savoring the best season ever on the gridiron by a Cardinal team. A season capped by a masterpiece in Orlando. This was the 1st game this year that Teddy either chose to or was allowed to actually try to gain yardage as a runner, rather than getting out of bounds at the earliest sign of getting hit. He showed skills he had shown in high school and in his early years here, but kept under wraps this season until his magnificent performance, that officially put an end to this years hurricane season ! Once before I saw a team as masterfully prepared. Coach Schnell’s Fiesta Bowl team knew every play to run against Bama and when to run them and knew everything Bama would run before Bama did. I know he professed neutrality at this game but you have to think some of this rubbed off on Charley. Of course having Teddy B execute the plan can’t hurt. Not even a lip-service mention of your evil BBN? Is readership that good? Or is your thirst quenched from the 7 point drubbing? They did give up one 4th Q TD on a 7 play, 55 yard drive. He also rushed for 48 yards on 6 carries.